Human rights activist and English political candidate, Mick Bowman, alleges he was beaten and arrested at a peaceful demonstration in Palestine on Friday. A human rights activist from Tyneside, in North East England, claims he was beaten and abused after being arrested while taking part in a peaceful demonstration in Palestine on Friday. Mick Bowman, aged 57, from the United Kingdom, said he was pepper sprayed in the face from less than six inches away during his arrest Friday afternoon. He was then detained without charge by Israeli soldiers for 24 hours and then released. The case of Mr. Bowman's violent arrest is being investigated by an Israeli authorities who claim that his alleged treatment was "unacceptable" and "inappropriate," according to a statement received by IMEMC. Mr. Bowman is a member of the Newcastle Palestinian Solidarity Campaign (NPSC) located in Newcastle-upon-Tyne in England. He is also actively involved with his local branch of Amnesty International. Bowman was taking part in a peaceful demonstration along with other international solidarity volunteers protesting Israel's continuous violations of Palestinian human rights in the village of Bil'in, located in the West Bank just north of Ramallah. Witnesses at the Bil'in protest tell IMEMC that Mr. Bowman did not commit any violent acts and that he was arrested for no apparent reason. Palestinian, Israeli, and international activists gather in the village of Bil'in each Friday to protest the construction of the illegal Israeli separation wall which has divided the village. Previously, President Jimmy Carter has joined the Bil'in protests, as has Richard Branson. In April 2009, a Palestinian man, Bassem Abu Rahmeh was killed when an Israeli soldier fired a teargas canister into his chest. The death of Bassem Abu Rahmeh was depicted in the 2011 film, '5 Broken Cameras.' The following year, Jawaher Abu Rahmah, a 36 year old woman, was also killed following protests at the village. The conditions of Ms. Abu Rahmah's death were contested and most likely she died from suffocation following teargas being hurled at her face. In a message Mr. Bowman sent to coordinators at NPSC, he says he was told he was arrested for allegedly assaulting an Israeli soldier. He wrote in the message: “That was why they had detained and restrained me with ‘appropriate force’ (standing on my hands and thumping me etc to get the plastic cuffs on and then pepper-spraying my eyes from a distance of six inches after I had been cuffed but refused to stand up). “The military were extremely aggressive from the outset in how they responded to what was a peaceful demonstration. Mick Bowman is a mental health social worker in his native UK. 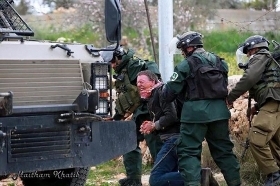 He was held for 24 hours by Israeli soldiers during which time he was processed by the military, interviewed by Israeli civil police, and taken to a military court. He was released on Saturday night with stipulations that he never return to the West Bank. Mr. Bowman is now in Jerusalem and due to return to the UK on Thursday. Image caption - crush the voice of humanity.